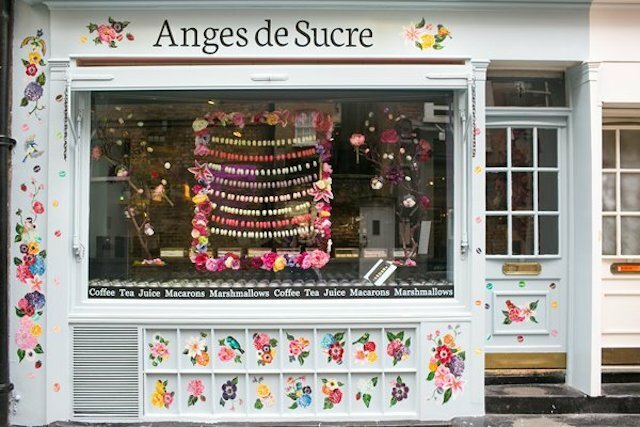 UPDATE 2016: This shop is now closed, but Anges De Sucre still operates as an online business. 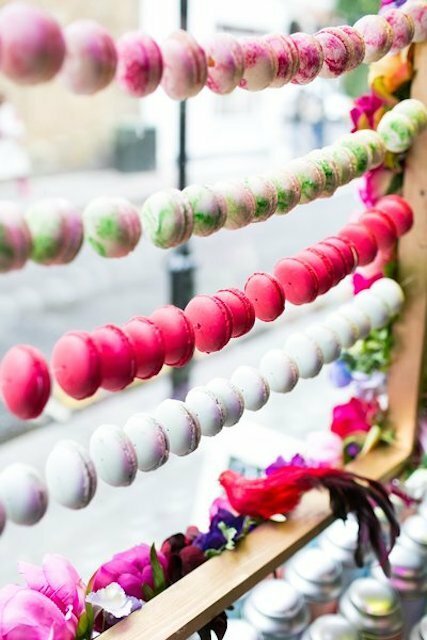 Just in time for the wedding season, this little trinket box of a patisserie selling macarons and marshmallows has opened amid the bijoux boutiques of Kensington. It’s where the tiniest branch of Ottolenghi – the one not many people seemed to know about – used to be. 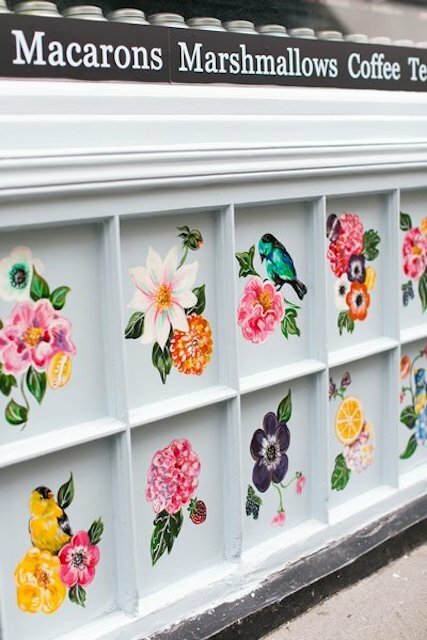 The strikingly pretty shop front, painted with gaudily coloured tropical flowers and birds, sets the tone of fantasy and romance that continues inside. 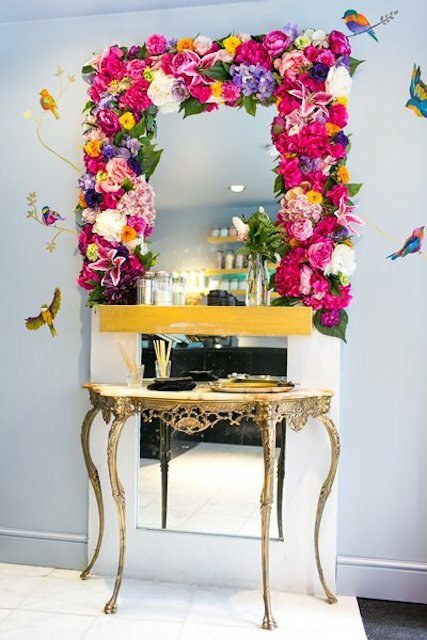 An ornate mirror by the entrance is framed by a flamboyant display of psychedelic flowers. 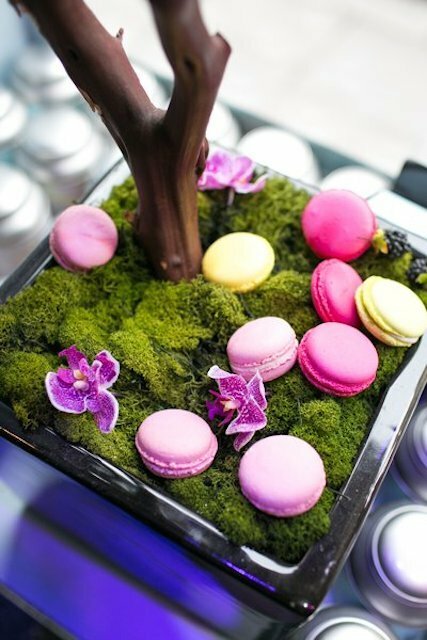 The floral theme is used in the window, too, where macarons (or macaroons, as they’re more popularly known in the UK) hang like exotic garlands, and marshmallows sit daintily amid summer garden-themed paraphernalia. 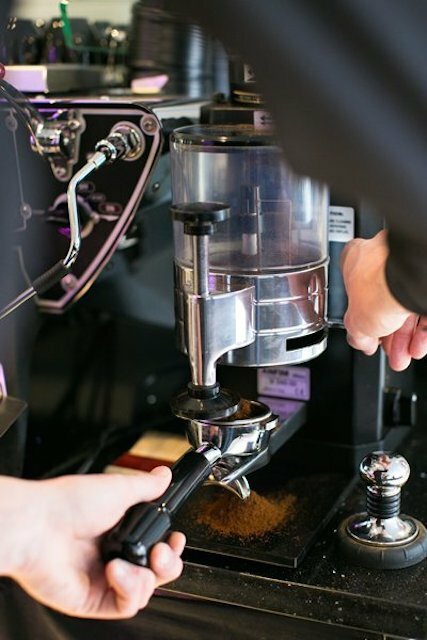 All this extravagant frippery is offset by sleek white marble floors, a smart black quartz serving counter and a handsome Kees Van Der Westen Spirit espresso machine. Anges de Sucre – which is French for ‘sugar angels’ – is owned by Reshmi Bennett, a Londoner of Indian origin, who was brought up in Kuwait and lived in Paris for a year. Formerly an investment banker, she trained in classical French cuisine at the prestigious Ecole Gregoire-Ferrandi in Paris and worked with a Michelin-star chef. It’s no wonder her confections have a mixture of British, Indian and French influences. There are masala chai macarons; and soft, squidgy marshmallows in flavours like ‘Goan Colada’ and ‘kheer’ (Indian rice pudding – but here made without rice) spiked with rose and cardamom. The latter is very popular for Diwali and Asian weddings. In fact, the company started by catering for weddings and events, before becoming an online gift business; this is their first bricks-and-mortar shop. Bennett is planning to turn the cosy basement into a wedding consultation area, where prospective brides and grooms can come along for tastings. 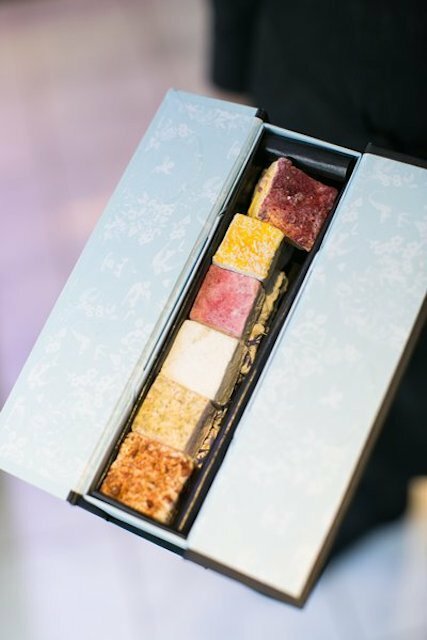 Top-selling marshmallows (90p each), cube-shaped like turkish delight, are flavoured with banana and salted caramel, rose and pistachio, and passion fruit and raspberry. Bennett’s own favourite is pineapple, mango and coconut. Although currently made with pork gelatine, Bennett is experimenting with agar-agar and other veggie options “because my own mother can’t eat them – she’s vegetarian”, she says. Among classic jewel-coloured macarons (£1.75 each) like rose, vanilla and salted caramel, the lemon flavour is one of Bennet’s favourites – and ours too – as it’s full of zip and zing, bursting with sunshine flavour and colour. Special varieties include ‘coco loco’ (coconut and chocolate) that tastes like a superior version of the Bounty bar, delightfully cake-y ‘cococcino’ (made from their own coffee blend), and ‘nuts about Ella’ (hazelnut and dark chocolate, inspired by Nutella and Ferrero Rocher). 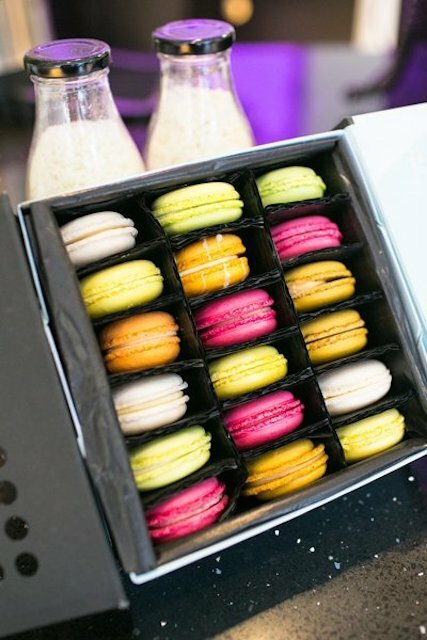 Although a minimum amount of food colouring is used in some macarons, no artificial flavours are added to anything. Organic vanilla pods, not essences, flavour the vanilla sweets; and the rose flavour is achieved by infusing dried rose petals and organic rose buds. As you’d expect in a shop specialising in luxury treats, only premium ingredients like fresh fruit, fine Belgian chocolate and free range eggs will do. These delectable confections are made in the company’s kitchen in Acton — where Bennett works four days a week – and delivered here daily. She experiments with different flavour combinations in the evenings and says: “Creating new flavours, and embellishments like sprinkles on top, are the fun, exciting part. Every variety goes through eight or nine taste tests. In a macaron, the filling and the shell should balance and complement each other, and this is not as easy as people may think.” She’s introducing more flavours soon, such as peanut butter and banana, and lychee and raspberry. The shop is as geeky about coffee as it is about the sugary stuff. It’s the first in England to sell the highly acclaimed, artisan Coutume coffee slow-roasted in Paris; and it’s even launched it’s own honey-roasted Miel Blend. Additionally, it sells its own blend of teas in beautiful caddies (£8.50); and, despite limited space, bakes a few croissants and pastries (£1) daily on the premises. Also available is a choice of white, milk and dark hot chocolate made from organic milk and single origin chocolates. Bennett admits she feels a childish sense of excitement dunking vanilla marshmallows in dark chocolate, and rose and pistachio in white. If you’re craving a touch of magic and a sprinkle of fairy dust, these sugar angels will transport you to another world.